← “Bruce” in the City STRONG!!!! A month into a hopefully better year, many of us are trying to develop healthier relationships with food, and more healthful daily habits. I’ve found it challenging. Last year, I felt a lot of stress at work and made the decision to go back to school. I love being in school, but it has challenges of it’s own. For me, keeping a healthy habit of eating regular meals at reasonable times of the day, with appropriate portions, is definitely a struggle. I put off eating to work and complete tasks. I’m terrible at scheduling time to food prep, and most of all, make my health and well-being a priority. And I am a breakfast skipper. I never make time for breakfast or even a coffee if I have to go to school or work early in the morning. And I’m a night owl, I can’t help but sleep in as much as possible in the mornings to make up for my lack of an early bedtime. So when I put off eating a healthy meal until I feel like I can relax, sometimes I don’t have any food until 5pm or later. Which then leads to feeling overly hungry and deprived, and having larger portions in one sitting. I don’t generally make resolutions for the new year, but since I decided to leave my job in August to go to school and make a change to how I was feeling, I’ve been trying to make improvements. Nothing too daunting. Just trying to add better habits to my daily life. A friend from school was talking about how busy she was, and that smoothies saved her so much time. I was intrigued. 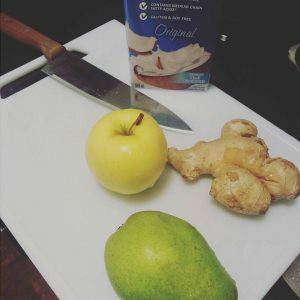 I would enjoy the occasional smoothie in the summer but they weren’t something I had often, and I could say that I actually had never made one before. I felt a little daunted by choosing an expensive blender, and felt like I might not use it, that it might just sit there after the novelty had worn off. However, my friend introduced me to the idea of a hand blender. It’s funny, because these must have been around for a while, I just wasn’t in the loop, and didn’t know that they were a great option. Especially if you don’t want to make too large portions, or have a small kitchen/little counter space. And what was even nicer, my stepmom gifted me a really cool hand blender for Christmas after to talking to her about my interest in trying out having smoothies for breakfast. There are so many ways to make easy smoothies. 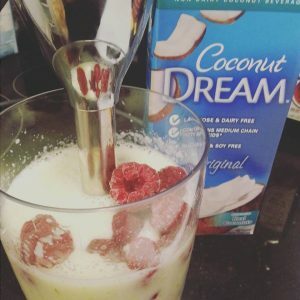 I found I like to use almond milk or coconut beverage to create my breakfast drinks. First smoothie I made consisted of vanilla almond milk, frozen blueberries, and a frozen summer fruit mix I had bought to use for sangria but forgot about. And it turned out pretty good, didn’t have much almond milk to be honest, but it was like a yummy fruit slushy. Couldn’t complain. Now I just add a bit more liquid. I still don’t measure anything but as you practice, you know what works for you. I’m still learning and trying new combinations. The best part, is that I’ve been able to incorporate my breakfast smoothies into my daily ritual. 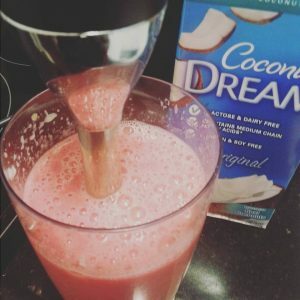 I usually make my smoothies at night (while I cook dinner), so that I can down a portion quickly before I run off to work in the morning. I’m trying to make this a healthy habit that still works for me. A recent combination I tried was an apple and pear cut into small pieces, joined by a handful of frozen raspberries, coconut beverage, and a couple of slices of ginger. I wanted to share my recent experience because I think we all have struggles incorporating healthy habits, and it can be hard to focus on spending time on taking care of ourselves. I hope everyone is having a good year so far. Cheers to making small changes that can make a big difference in how we feel in the present, and hopefully the long run.